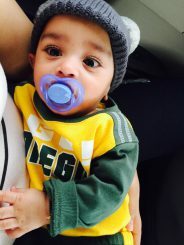 Duck Family Day is a new feature for every Saturday where Oregon fans share their stories of … being Oregon fans! Email charles@fishduck.com to share your experiences of you and your family and what it means to be a Duck fan. Pat Pannu has been a writer, editor, and supervisor for FishDuck.com and is extremely passionate about our beloved Ducks, the same as you. Contact us and share! The first time I ever went to a football game, I slumped down in the seat and fell asleep twenty minutes in. What makes the situation even more amusing is that I was eleven, old enough to be able to stay awake for three hours, and it was a Seattle Seahawks game. While the Seahawks weren’t the football powerhouse they are today in 2002, it was the team’s first year in the brand-new Seahawks Stadium (now CenturyLink Field) and the crowd was making a respectable dull roar. The fact that I managed to sleep through that showed my lack of interest in football remarkably well. One of my first games at Autzen. Still overwhelmed at the Autzen experience. It would be two years and a move from Seattle to Eugene before I’d willingly go to a football game again. Watching my younger brother run around on a field wearing pads and a helmet bigger than he was, I started thinking that maybe football wasn’t so bad after all. A few weeks later, on the night before Halloween, I found myself watching the Ducks run all over the Washington Huskies (31-6) in what would become of first of 11 straight Oregon wins, and I fell in love with Oregon football. Of course the Ducks then went on to lose the final three games of the season and left me wondering what I’d gotten myself into. I didn’t need to worry for long as the Ducks came back with a vengeance in 2005, going 10-1 in the regular season and losing to Oklahoma in the Holiday Bowl. Along with my brother, I spent that season on the edge of my seat just waiting for the madness to end. Thankfully it didn’t end that year and ten years later, it’s going stronger then ever. 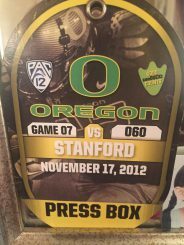 My very first game at Autzen Stadium was on Saturday, September 2nd, 2006 when the Ducks took on the Stanford Cardinal. My brother and I were at the game thanks to a pair of tickets from a vendor at our parents’ business. 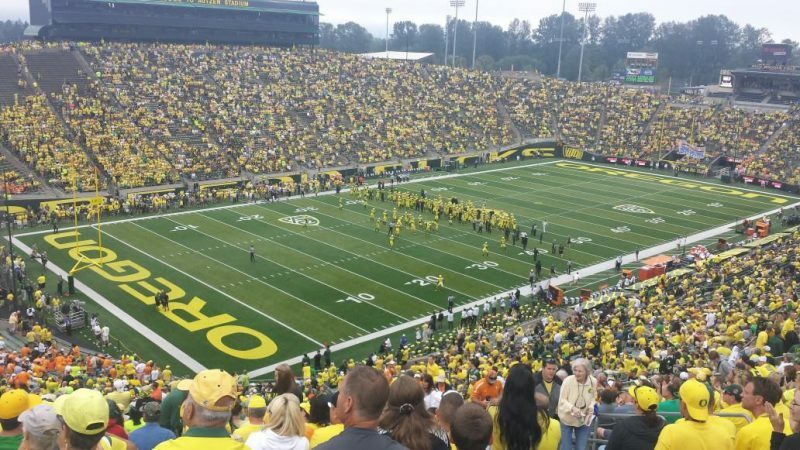 Our seats were on the very top row of section 35, and I remember grumbling quietly to myself at all the stairs before sitting down and falling quiet at the sight that is Autzen Stadium on game day. In something that would become known as “typical Ducks,” the game was over before half time as the Ducks trounced the Cardinal, 48-10. As you can tell, I really love my Ducks. My press pass from the Stanford game. made enough middle-of-the-night trips to Caspian that I could make it there in my sleep. I got a chance to be in a place where we discussed politics or literature for 90% of the class, and then morphed into pure fans the other 10% of the time and discussed the Ducks’ latest game or their upcoming opponents. I’m already teaching the youngest member of my family who the best team is. loss of the season, 17-14 in OT. The fact that you are not allowed to celebrate or cheer for a particular team in the press box meant that that was also the day I learned how to have a very silent meltdown. Since that first game in the press box, I’ve gone on to see a few more games as press and countless games as a fan. Yet every single time I start walking across the bridge towards Autzen, the excitement starts buzzing in my veins and I know that regardless of the outcome, I root for the best team of them all.